I woke up 9:30 & 10:45 feeling the cold maybe just about over. I got up at noon and at 2:00 we checked out of the hotel, got the car from the garage and loaded it. Marcia sent some jeans and shirts out to the laundry and it arrived a day late. I noticed it had not been ironed at all and when I saw the bill was $170 I raised an objection. After the gal called the laundry, she told me there would be no charge. It pays to speak up. 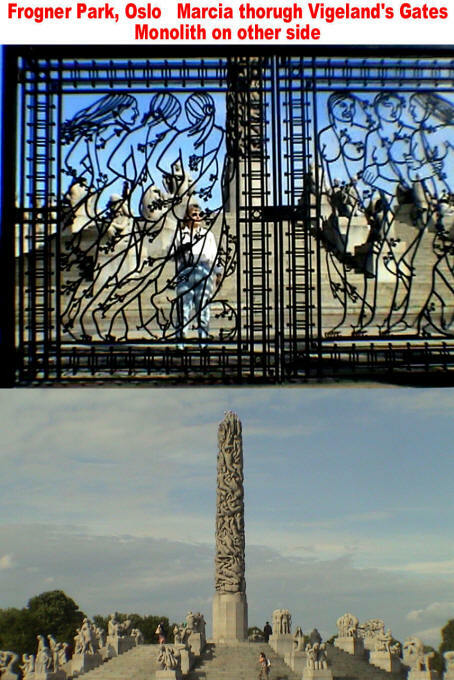 I went for my run at 3:00 and made it up KJGate all the way to the top of the hill where the Royal Palace sits. The last part of Norwegian history is that after they successfully seceded from Sweden in 1905 without a war, the people voted to have a monarch. But after 400 years of Danish & Swedish rule, the Norwegian royal family had died out. So they invited Prince Carl (second in line to the throne of Denmark) to be their king. He changed his name to Haaken VII and was crowned in the Nidaros Cathedral in Trondheim. He changed his son’s name to Olav V, who became king upon his death in 1957. 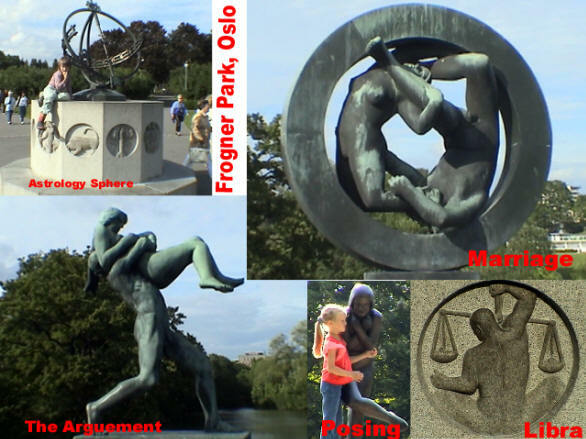 When Olav died in 1991, his son Harald V became their present Kong. [Funny – King = Kong.] The palace (Det Kongelige Slottet) was built from 1836-48 by King Karl Johan. He was actually a French marshal named Jean Baptiste Bernadotte who became King of Sweden and was aligned against Napoleon. After Napoleon was defeated at Leipzig in 1813, Karl marched into Denmark and obtained the surrender of Norway over to Sweden. This Norway-Sweden union called the riksakt lasted until 1905. 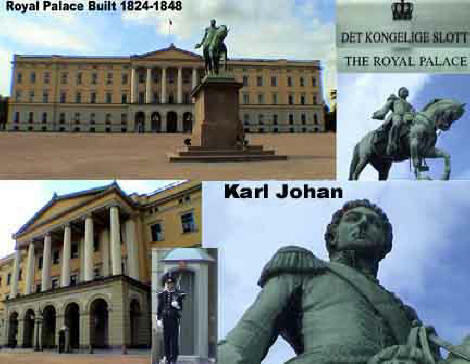 Though a Swedish king, Karl Johan was very popular with the Norwegian people. I tried to get inside the palace, but they only started appointed guided tours in 2000 and you need to schedule it in advance at the Post Office. So much for that. I then went by Oslo’s City Hall called the Radhusset. Its twin towers look out to the fjord and it has a beautiful clock and several motifs along the east side of the building. There is also a stone relief of Kreig’s famous “Albertine” (story & play) characters on one corner of the stone. I stopped at a Navarsen and bought two 550 Kr telephone cards and then remembered I wanted to get in and see the castle before it closed at 4 PM. It was 3:50 and no way I could make it in time so I broke into a full run all the way up the hill and arrived exhausted at the entrance of the Akershus Slott at 3:58 where the guy was about to close up. He saw my condition and let me in for free (saved 90 Kr) if I promised to take only 10 minutes. No photography was allowed so I ran through the place pretty quickly and videotaped all of it except the 17th Century Christian IV’s Hall which had two guides and a soldier sitting there. The Royal Mausoleum down below contains the bodies of Haaken VII, Olav V and their wives. 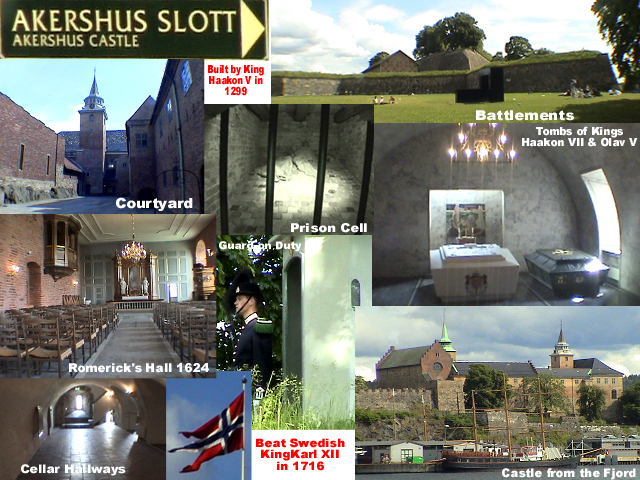 The Slott was built by Håken V in 1299 and sits atop the hill overlooking the Oslofjord. It defended against a siege by the Swedish king, Karl XII in 1716. I walked back down the hill and had a cappuccino at the Albertine Café Bar and then went back to the hotel to change in their men’s room. While changing, a guy comes in and tells me there is a whole spa downstairs with changing rooms. A little late to know now. 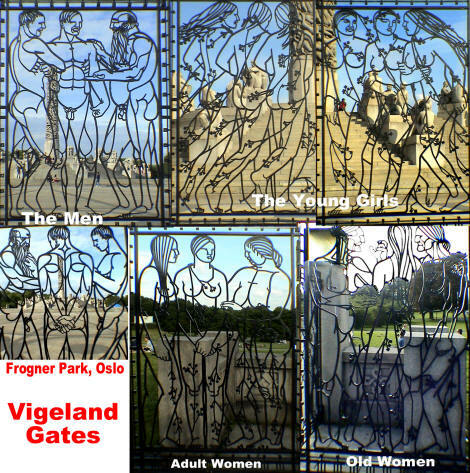 At 5:15 we leave the city center and (with the GPS) finally find Frogner Park also known as Vigelandsparke. We heard this was something worth seeing and they were certainly right. 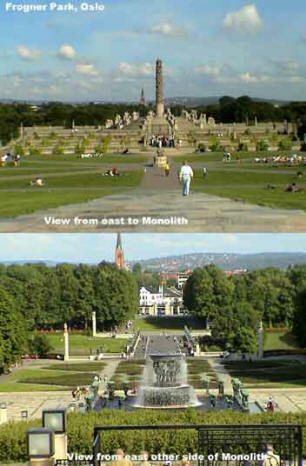 Gustav Vigeland was Norway’s most famous sculptor and he began work on this park in 1924. 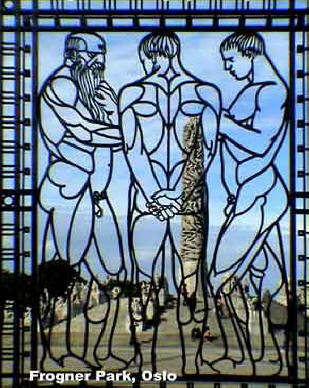 The focal point is the 56 ft tall monolith on the top of a hill sitting on a stepped plinth surrounded by 36 groups of human figures depicting cycles of life and human relationships. 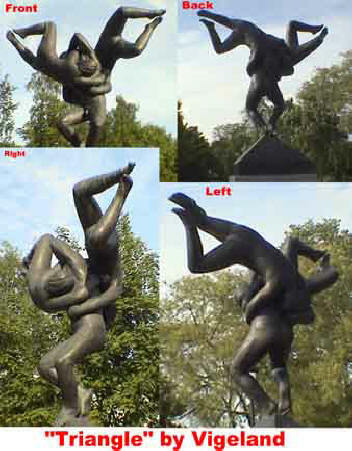 The monolith is comprised of 121 human figures holding on to each other. 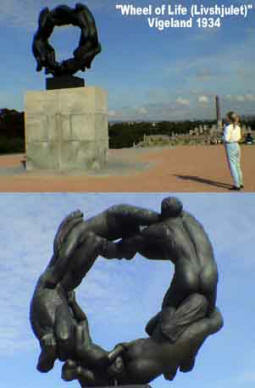 It is quite dramatic and somewhat phallic. 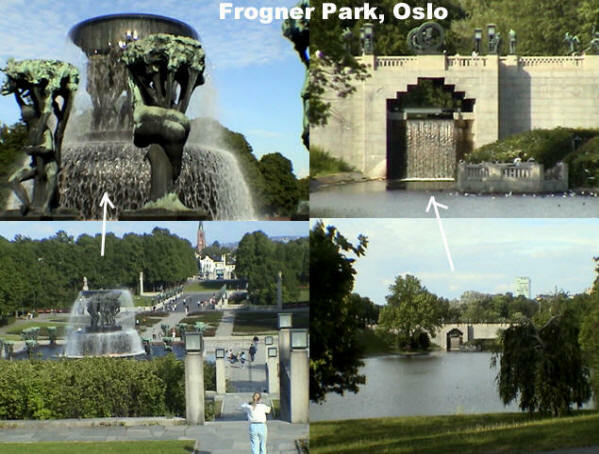 Above is the “Triangle” a guy and two gals and below are the many figures on the bridge across the lake; "Marraige", a couple within a ring (below right) and finally the incredible wrought iron sculptured gates that lead to the monolith. It was so fantastic; we spent almost 2 hours there. We finally headed out of Oslo at 7 PM and went to enter our next city (Sandefjord) into the GPS and discover that once you leave Oslo the GPS disk has nothing else about Norway! What a bust. We are now on our own for directions.